1. Minister of Industry and Technology 1999-2001. 2. Chairman and CEO of Enppi 1980-1990. 7. Senior Consultant, Abu Dhabi National Oil Company (ADNOC), 1990/91. 8. Conseiller Technique, SONATRACH, Algeria, 1968-1974. 9. Research Engineer, Textile Fibers Department, E.I du Pont de Nemours & Co., Wilmington, Del., USA 1960-1965. 10.Inventor of US Patent number 3,248,241. 11. UNIDO Consultant on Capital Goods, Petrochemicals, and Licensing of Patents. 12. Director of Refining, Petrochemical Projects and Engineering Services, Suez Oil Processing Company 1974-1980. 13. Member, Supreme Council of the National Academy of Science, Research and Technology, 1984-1990. 14. Member of the Board, Egyptian General Petroleum Corporation, EGPC, 1985-1990. 15. Member of the Board, Alexandria Tire Company, 1995-1999. 16. 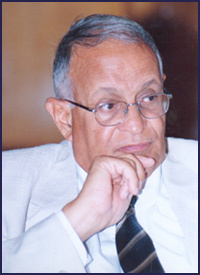 Member of the Board, Egyptian Petroleum Research Institute, 1984-1990. 17. Petrochemicals Pilot Company, Deputy Chairman, 1977. 18. Member of the Board, Geisum Oil Company, 1988-1990. 19. Member of the Board, Chamber of Petroleum and Mining, the Federation of Egyptian Industries, 1987-1990. 20. Member, Refining and Processing Council, Academy of Science, Research and Technology, 1984-1990. 21.Recipient of six international awards and honors. 22.Holds B.Sc.Ch.E. from Cairo University, M.Ch.E and Ph.D. in Chemical Engineering from University of Oklahoma. Licensed Consulting Engineer in the Design and Management of Chemical and Petroleum Projects. Elected Member of Sigma Xi Honorary Research Society. Author of several papers and UNIDO reports.